This entry was posted in Clothes, Selfish Sewing and tagged bianca dress, bianca dress with lining, double gauze fabric, handmade easter dress, made by rae patterns by oliver's fancy. Bookmark the permalink. I think I said this already on IG – but this is gorgeous!! So worth the double gauze extravagance! Thanks! And the double gauze makes it feel so luxurious! Can’t wait to see all the other versions pop up after the pattern is released. This is gorgeous on you. You can see from the radiance on your face how much you love it. To me, THAT is what sewing your own wardrobe is about. Making things that make you FEEL wonderful and oh so pretty, as well as looking good. Thank you. You are too kind! And I totally agree with you. It’s so rewarding to find ways to make things fit just perfect on you! Why thank you. The bike just happened to be sitting outside so it was an impromptu photo prop but it ended up being so fun. It is a fairly simple pattern and I think it would be a great place to begin! If you want something a little more basic, Rae’s ruby top/dress is another great beginner sewing pattern. Very nice dress, I love it! Is that your bike? Is it harder to sew with the double gauze? It’s my husband’s cafe racer. 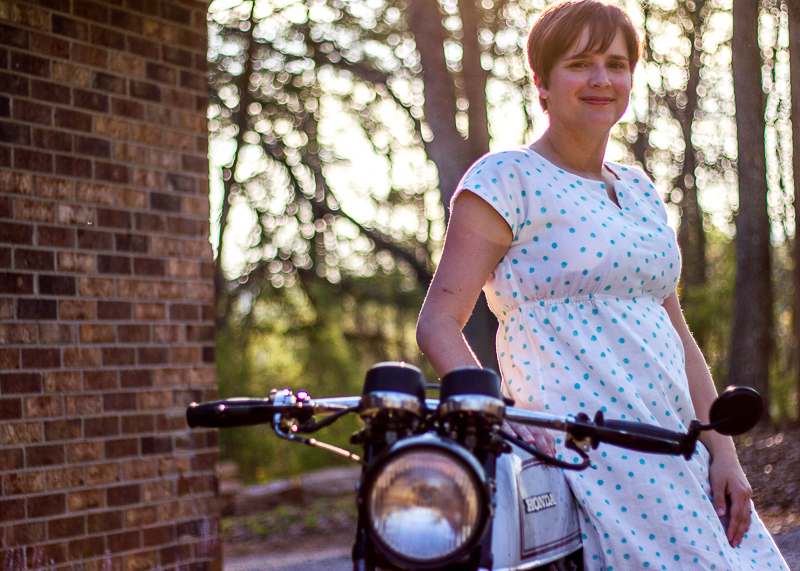 I have never ridden a motorcycle and have no plans to anytime soon but it was fun to take pics with it. The double gauze was a little different to sew with but not difficult like a knit or anything.